The digital space has entered every facet of our daily lives with the help of connected devices, establishing the ‘digital consumer’. On average, every American citizen has four digital devices on which they spend 60 hours a week. Of the most common and popular digital devices are smartphones, tablets, and HDTV’s. Reliance on these devices has started to influence our TV viewing behaviors in the form of a second-screen. The infographic below from Nielson’s Digital Consumer Report provides statistics on how people engage with their tablets and smartphones while watching TV. The second-screen is commonly used to look up information about characters and plot lines, and to research and buy goods and services advertised. 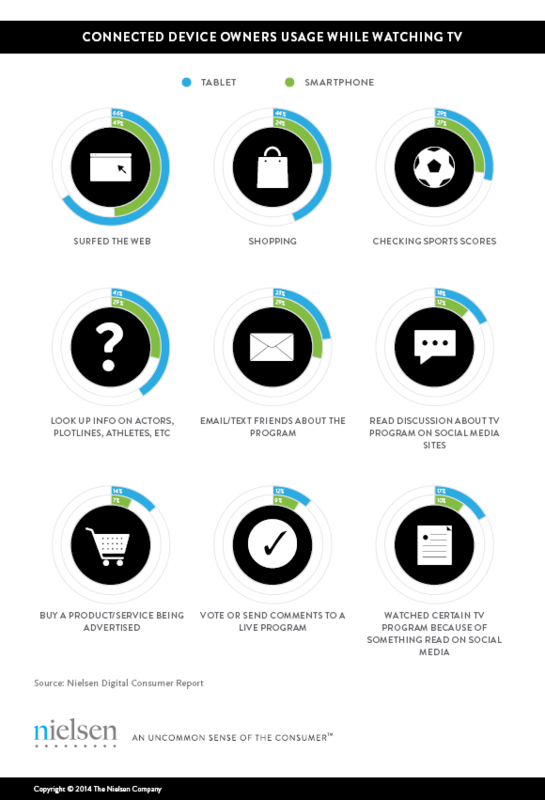 Of the most popular second-screen activities is discussing TV on social media platforms. Roughly one million Americans per day engage in social TV through tweeting. Consumers use the second-screen to engage with the television program they are watching in real time and by doing so, are able to create, participate, and foster online discussion with friends, followers, and other viewers around the world. Social TV engagement is becoming second nature and may even be considered an extension of actually viewing the program itself. Accompanied with the enjoyment for the social TV engager, is the transparency and readiness for businesses and marketers to view the social activity. Listening and analyzing social TV behavior can lead to a greater understanding of the consumers’ point of view and can help marketers foresee future threats and opportunities. This entry was posted in Social Advertising, Uncategorized by Lindsay. Bookmark the permalink.